With armed police officers standing guard, schools and about half of the Brussels metro system reopened Wednesday, four days after the Belgian capital was locked down in the wake of the Paris terror attacks earlier this month. The city remains under the highest threat alert level due to what authorities have described as a "serious and imminent" threat of attack. Authorities said the emergency measures imposed Saturday -- the closing of shops, schools and subways -- will be lifted Monday, if conditions remain the same. In Brussels, 300 additional police officers were called up to help protect city schools. Some officers stood guard outside school gates as parents dropped off their children. Children pass a police officer as they arrive for school in the center of Brussels, Nov. 25, 2015. 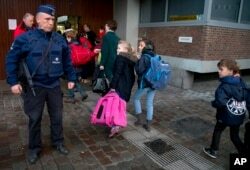 At the upscale College Saint-Jean-Berchmans school in Brussels, some of the children looked visibly worried, but most gave a warm greeting to a school official at the entrance guarded by police officers. Among the students at the school is Belgium's Princess Eleonore, 7. "I'm concerned, but I think that life must go on," Dimitri De Cra Yencour, a father of four, told The Associated Press. "Even if something happens in Paris or in Brussels, they have to go back to school," he said, adding he had instructed his children to be extra attentive and to tell their teachers if they see anything unusual. About 200 soldiers were assigned for protection around the city's metro stations. Meanwhile, Belgian and French authorities continued to search for two suspects with direct links to the November 13 Paris attacks, as well as up to 10 other people authorities fear could be planning further violence. Fugitive Salah Abdeslam, 26, is suspected of being the eighth person the Islamic State group said took part in the attacks in Paris that killed 130 people and left more than 300 dead. French authorities have suggested Abdeslam could have been linked to a discarded suicide vest found in a southern Paris neighborhood Monday. Although he was stopped by French authorities several times the night of the attacks, he was allowed to cross into Belgium because his name had not yet become known. 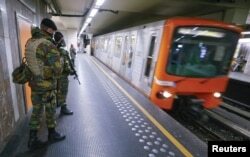 Belgian soldiers patrol in a subway station in Brussels, Nov. 25, 2015. Brussels' metro re-opened on Wednesday after staying closed for four days following tight security measures linked to the fatal attacks in Paris. Police are also hunting Mohamed Abrini, who was seen with Abdeslam at a gasoline station on the highway to Paris two days before the attacks, and was driving the Renault Clio that was later used in the attacks in Paris. Belgium issued an international warrant for his arrest on Tuesday. One of Abdeslam's brothers, Ibrahim, was a suicide bomber in the Paris attacks. Another brother, Mohamed, who was briefly detained by French authorities after the attacks, appealed on French media Wednesday for his fugitive sibling to surrender to police. The attacks in Paris led to France stepping up airstrikes in Syria against the Islamic State group, which claimed responsibility for the coordinated bombings and shootings. 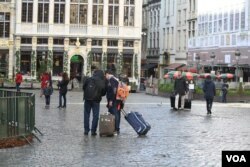 More than two dozen people have been detained in Brussels since November 13, though all have been released except five. They have been charged with terrorist offenses, including three who drove Abdeslam in their cars after the attacks in Paris. Belgian Interior Minister Jan Jambon said raids carried out Sunday night had been designed to foil an imminent attack in Brussels. Authorities had detained 16 people during those raids, but released all but one of them the following day. No explosives or firearms were seized. "Indeed, there were indications that there would be attacks on Sunday evening and they did not materialize," Jambon said. Otherwise, he said, "you don't impose terror level 4," the highest possible. He refused to elaborate what kind of attacks the government believed had been planned. Meanwhile, the Belgian government on Wednesday ordered health and emergency services to take measures to ensure their services aren't infiltrated by extremists. "We have to be sure that we can see everybody has an identification badge," Health Minister Maggie De Block told VRT network. "When ambulances arrive, we have to see from where they come, who is in it. Really as a precaution." French Interior Minister Bernard Cazeneuve said Tuesday that police there had executed more than 1,200 anti-terror searches since November 14, and handed preliminary charges to 124 people. Police have also recovered 230 weapons. U.N. climate talks open in Paris on Monday, with about 140 world leaders expected to attend, including U.S. President Barack Obama. Cazeneuve said Wednesday that tight security would be imposed for the conference, with road traffic restrictions, border controls and additional police and troops deployed. He said 120,000 police, gendarmes and soldiers are deployed across France to ensure the country's security. Belgium's capital, Brussels, remains on its highest level of alert Wednesday through at least Monday as authorities continue to search for several suspects connected to the Paris attack. But the city did return to some normalcy with kids going back to school and much of the city's subway system reopening.